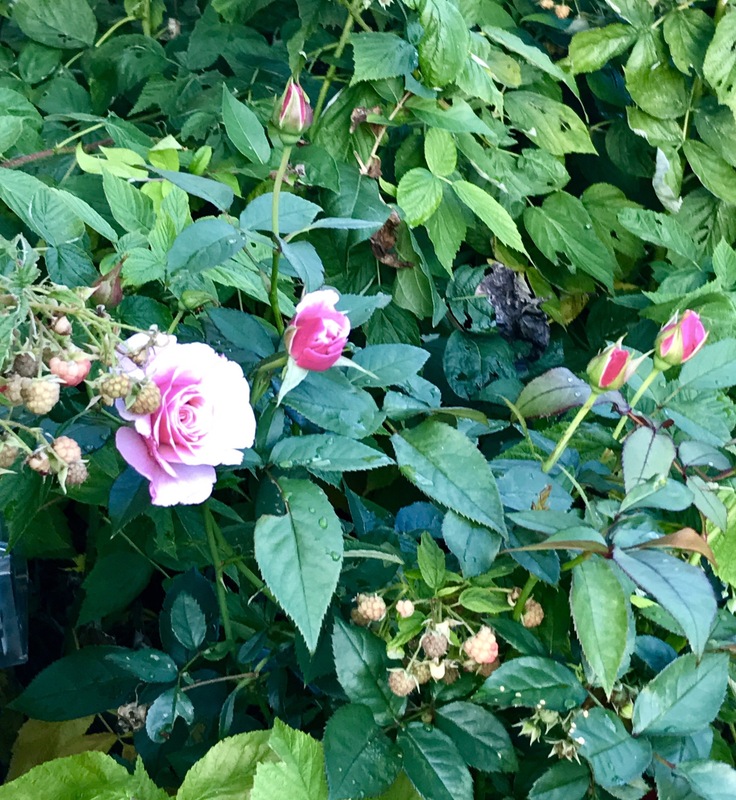 No, this is not a fruit-bearing rose bush. This is where our raspberry plants have grown into where our rose bushes are. The raspberry plants are winning. The roses are surviving, barely. It seems ironic that raspberry plants have thorns, because this photo reminds me of the parable of the farmer who sowed seeds on different types of soil. “Some seed fell among thorns, and the thorns grew with it and choked it.” (Luke 8:7) How hard it is to keep the thorns out of our lives! I love images of the sun rising (and sunset). This photo was taken just as the sun was about to appear above the ridgeline. One of the pleasures of hiking among numerous mountain peaks was being able to see the sun “rise” more than once most days as we hiked. 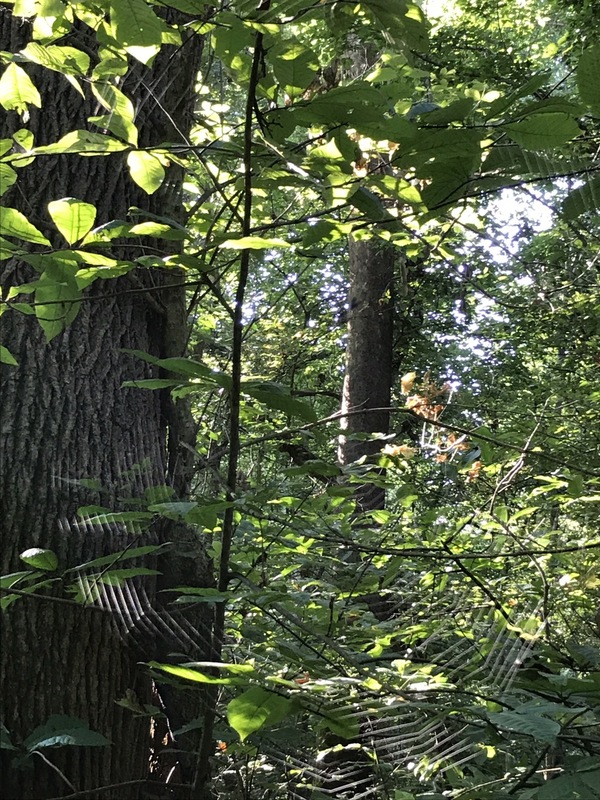 For me, this serves as a wonderful reminder for being present in the moment – there is joy to be found in the time before an event as well as the event itself. I didn’t realize how hard it is to get a good picture of a cobweb until I failed a number of times. And by “good” I mean a picture where you can actually see the cobweb. The light has to be just so, and it helps if there is dew on the cobweb. Background is important- contrast is necessary. I’ve written before about how important perspective is and how different things can look from different perspectives. And how that same principle applies to our lives and seeing God. The natural extension of that principle is that sometimes we need to “move around” and change our perspective before we can see God. 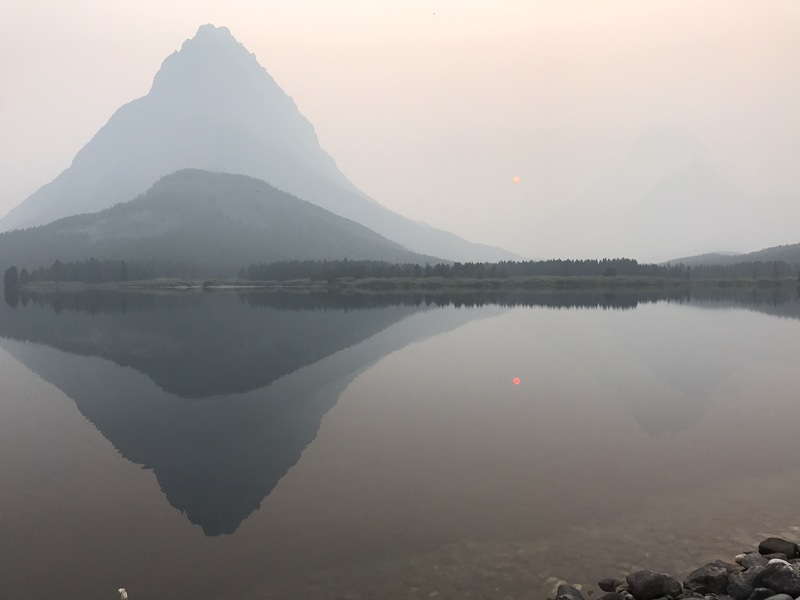 There were terrible forest fires burning while we were at Glacier NP. In fact, multiple trails were closed and part of the main road through the park was closed due to the biggest fire. 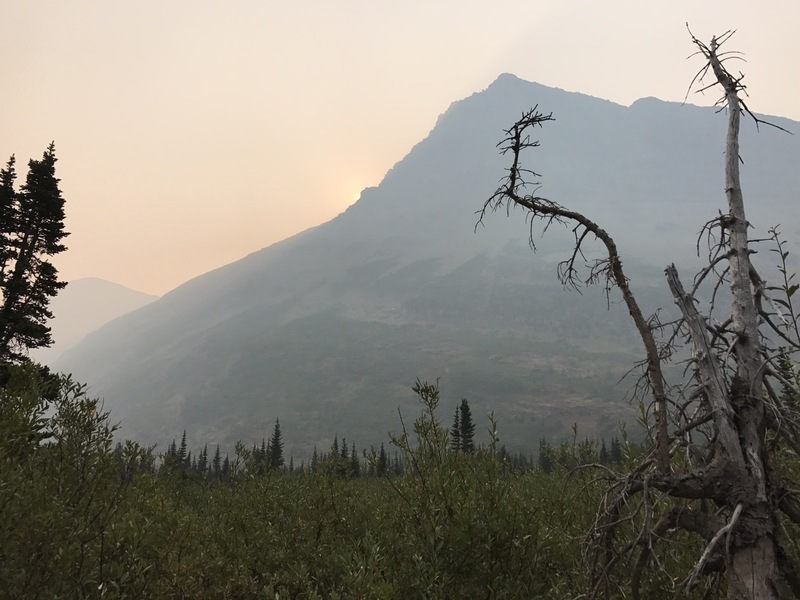 It was sad to think about all of the trees that were being burned as well as the threat to buildings in the park and those responsible for fighting the fires. Visibility was quite limited on most of the hikes we took. However, as a consequence of the smoke, there were some dramatic views and picture opportunities involving the sun. This photo was taken in the evening and the sun was barely visible through the smoke. However, notice the reflection of the sun in the lake. It’s actually more visible than looking directly at the sun. What a striking metaphor for God’s presence in the world which is sometimes most easily seen through other people or events in our lives. We recently returned from a week of hiking in Glacier National Park. Talk about Seeing God! As those of you who know me would expect, I took more than a few pictures which I will be sharing over the coming weeks and months. I will try to provide a description or short story for each of them. This photo was taken near the end of our hike returning from Ptarmigan tunnel. 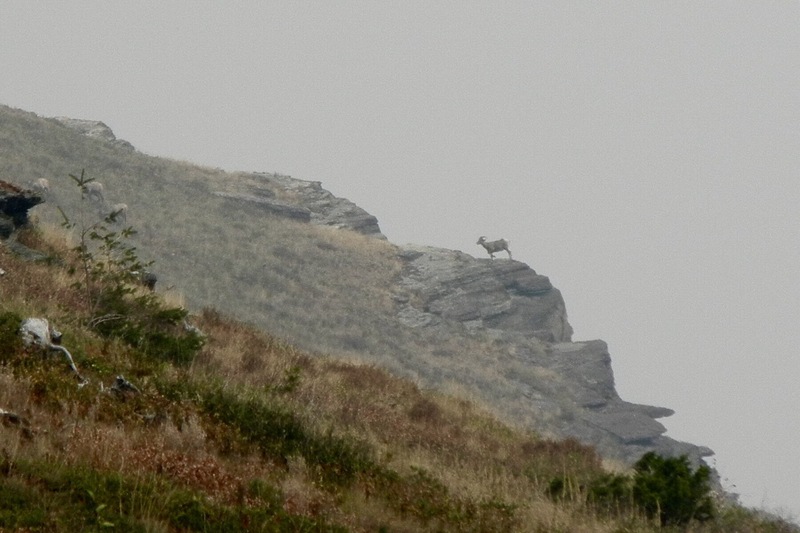 We saw several bighorn sheep on the way back; this one was hard to miss.